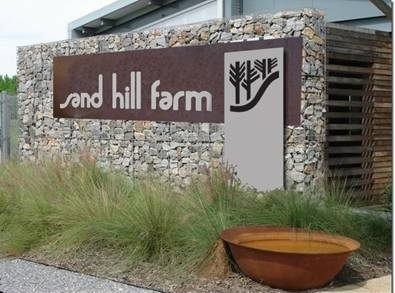 I used the new Sand Hill Farm Logo today in a post to Town, Gown and Lake about the Habitat for Humanity site at Sand Hill Farm. (If you’re not on Town, Gown and Lake and and want to read that post, I’ve included it below.) I chose to work with Shelly Schrimsher of Unlocked Creativity since this is a local project. I’d seen her work through her assistance to the Town on the Stellar projects and the new Town Logo. She helped me work through some of the ideas I already had and I think the collaboration resulted in something versatile that I can use for years. I wanted to include a graphic that brought the sand hill and associated woods into the logo. She did this in a creative way bringing the curve of the hill slope into the “s” in sand. I also asked for the graphic to be independent of the words to make it more versatile and she was able to to do that. And finally I had a vision of the entry sign made from rusted, cut, multi-layer metal on a gabion base/background to carry through the Culver Charrette field stone theme. From several examples I showed her, she was able to provide a mock-up capturing the concept. Now I can show the fabricators what the goal is – which makes it more likely they’ll achieve it for me. This is out for quotes now. Overall this was a good experience and I am pleased with the results. You’ll be seeing the logo show up more and more as the project moves forward. Give Shelly a shot if you have similar needs. As further evidence of my eclectic interests, here’s a picture of a Barn Owl and the story about it from the DNR Wild Bulletin. The barn owl pair on a DNR nest cam in southern Indiana is raising a second brood of chicks unusually late into the nesting season. The existence of a bonus round of chicks in 2017 is good news for barn owls because they are an endangered species in Indiana. 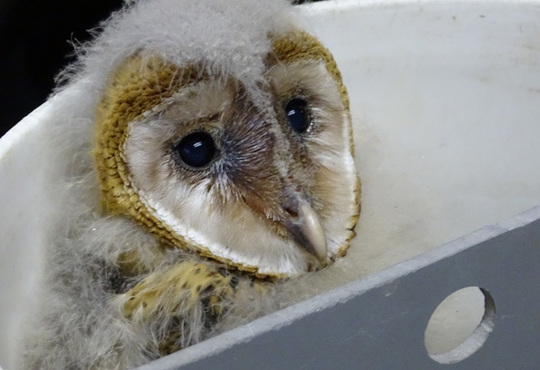 In 2015, only 10 barn owl nests were reported statewide. The mother owl laid this second clutch of eggs in late September, which is just within the standard barn owl breeding season from March to October. But this year was the first time this pair laid eggs that late while on the nest cam. Thanks to Robert Dragani and LPL Financial for their gift of a fresh wreath to help us celebrate the season!